Backcountry Skiing in Gudauri, Georgia. Guidebook for freeriders by Oleg GritskevichI have ridden each of the routes described in this section with my friends and clients more than a dozen times. I share this information and experience with those who feel they have the strength, confidence and, most importantly, the necessary skills to follow these routes independently, without a guide. But, no matter how much information I share, I cannot guarantee the correctness of the information on this website. I am not responsible for any injuries you may incur by attempting any of the routes I post on this page or elsewhere on the site. Use common sense - stay within your abilities, and if you want to go beyond your limits, do it only under the supervision of an expert. In this case, by the term "limits" I mean not only skiing on steep slopes in potentially dangerous areas but also the limitations of your practical skills in reading the terrain, choosing a line of descent, navigation, your survival skills, level of physical training, your language skills, etc. If in doubt, enlist the services of a professional Gudauri-based backcountry guiding outfit. Do not use this information only for route planning. At the very least, read the topographic paper map and use a compass. The lines on the map and the route tracks in the GPS files in this section may contain errors, may be incomplete, and may cause you to pass through a dangerous area. In a nutshell, use the information on this page at your own risk. Keep safe and enjoy every day in the mountains! Author of the Guidebook, Oleg Gritskevich. as well as topographic maps of our region can be in Gudauri Travel Bar, in New Gudauri area. 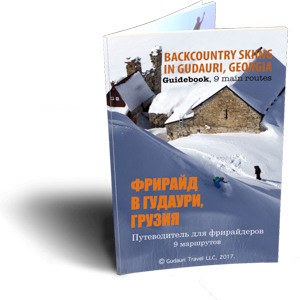 Copying any fragment of this guidebook is acceptable with active link to the source www.gudauri.travel.